HMS 'Victoria', Royal Navy 1st class battleship, c1890-c1893. 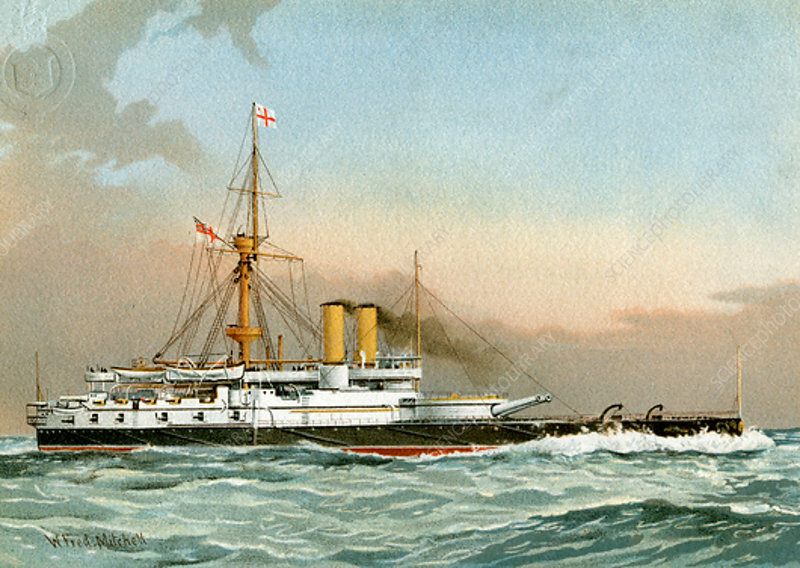 Commissioned in 1890, HMS 'Victoria' was the lead ship of her class of two battleships. She joined the Mediterranean Fleet as flagship, but on 22 April 1893 she collided with another battleship, HMS 'Camperdown', off Tripoli, Lebanon, and sank with the loss of 358 of her crew, including Vice-Admiral Sir George Tryon, commander of the Mediterranean Fleet. A print from Her Majesty's Navy Including its Deeds and Battles, by Lieut Chas Rathbone Low, Volume II, JS Virtue and Co, London, 1890-1893.